Which Precious Metals Are Likely To Be Better Investments? 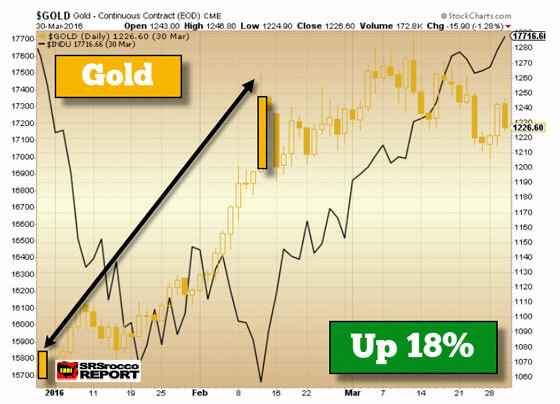 Which Precious Metals Are Likely To Be Better Investments During The Next Market Crash? The question on the minds of many investors, is which of the precious metals will be better investments during the next market crash? I should know because I receive this question in my email box quite often. So, I decided to test the price action of several metals and how each traded during a large market correction. This article will focus on the top four precious metals, gold, silver, platinum, and palladium. Even though Rhodium and other metals are considered precious, the ones listed above take the lion’s share of the investment market. Furthermore, while platinum and palladium are purchased as investments, they have a much larger industrial component than gold or silver. 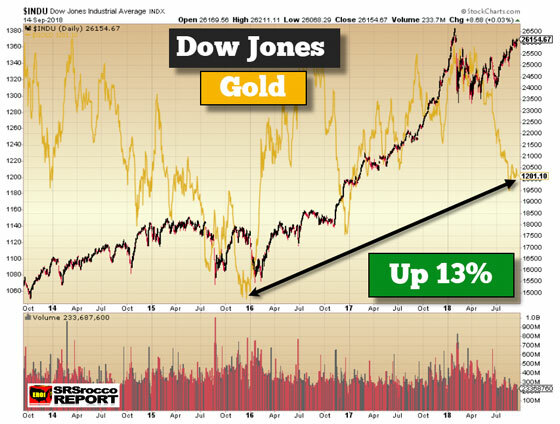 As I have mentioned many times, gold and silver disconnected from the broader markets when the Dow Jones Index fell 2,000 points in the first six weeks of 2016. Typically during a major correction, the market makes several attempts at a top. 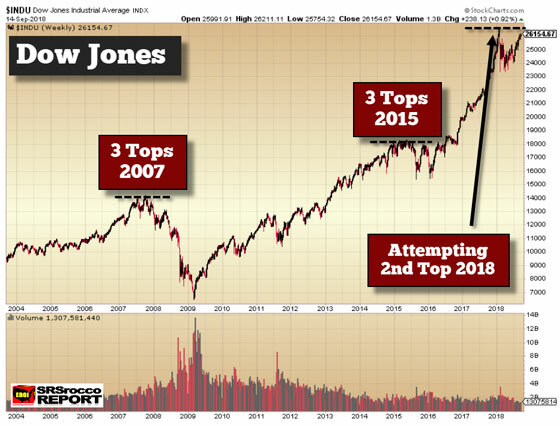 In 2007, there were three tops made before the market finally came down in 2008. Then in 2015, we had three more tops and two large corrections. 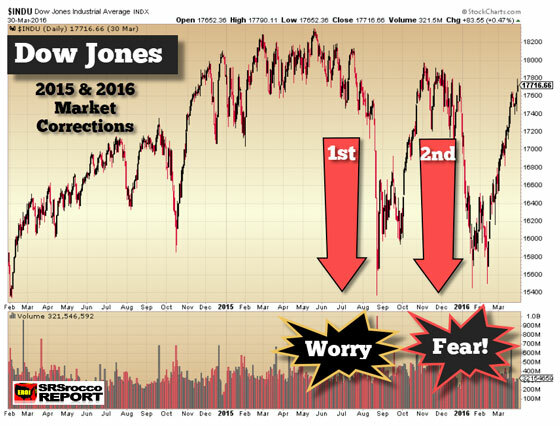 The reason investors’ worry turned into fear at the beginning of 2016 was that the last top did not reach the previous 18,000 level. You will notice that from March to July 2016, the Dow Jones kept trading above the 18,000 level. But by August, the market rolled over and experienced the first significant correction. 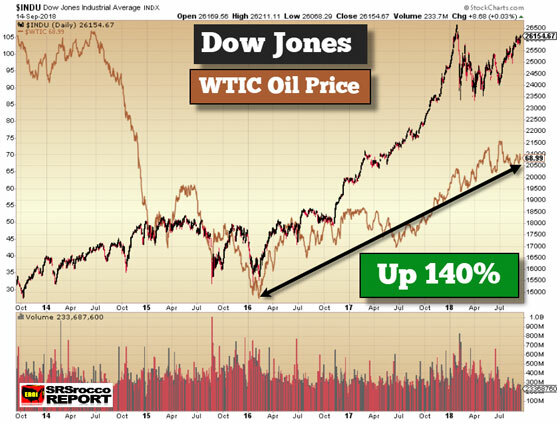 However, when the Dow Jones recovered in September and October, its peak did not surpass the 18,000 level. So, as the market suffered the second large correction, investors thought this was going to be the BIG ONE. While all three price charts above experienced NET LOSSES, copper, and oil trended in parallel with the Dow Jones Index the most. 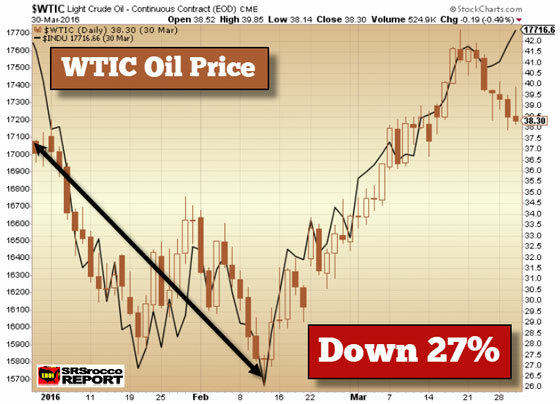 Thus, copper, platinum, and oil were more deflationary during the market downturn than gold, silver or platinum. 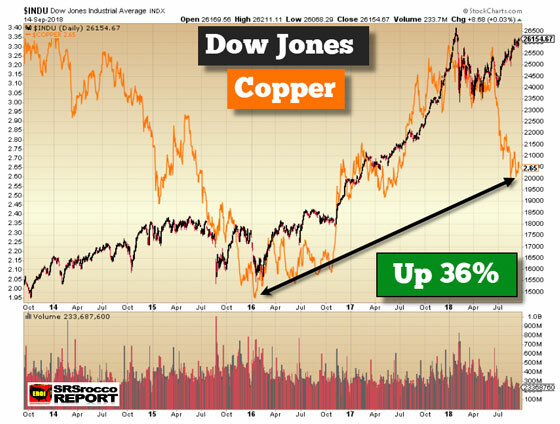 Moreover, you will notice that when oil and copper reversed, they mirrored the Dow Jones Index higher in Feb-March 2016. However, this present 9-year economic cycle is grinding higher with an ever-increasing amount of leverage and debt. So, at some point, this present market cycle will end… thus causing another violent crash. I was quite surprised to see platinum down a net 5% since the beginning of 2016. 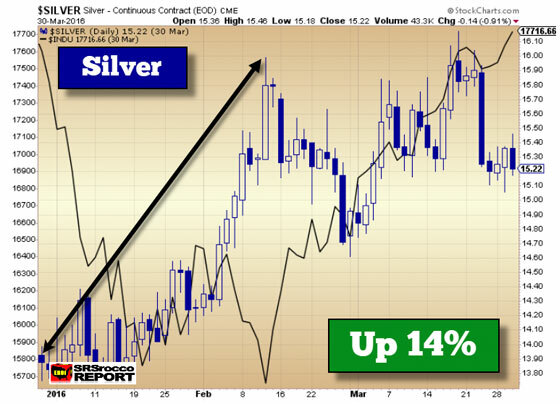 Furthermore, silver is only up a mere 3% and gold, 13%, during the same period. 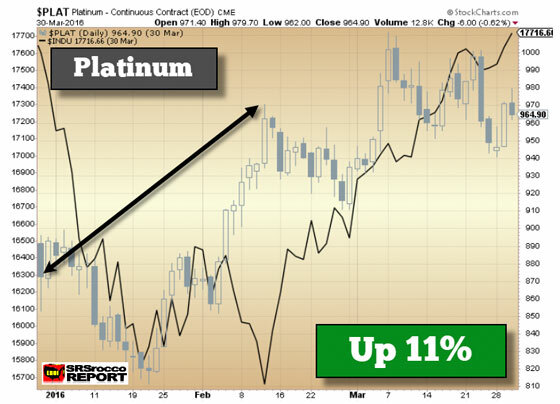 Of these three metals, the platinum and silver price trends look more identical than gold. That is because they have a much larger industrial component than gold. Copper is traded differently by the Commercial hedgers than gold and silver. While the Commercials are almost always net short gold and silver, they have been net long copper by a large degree in the past. 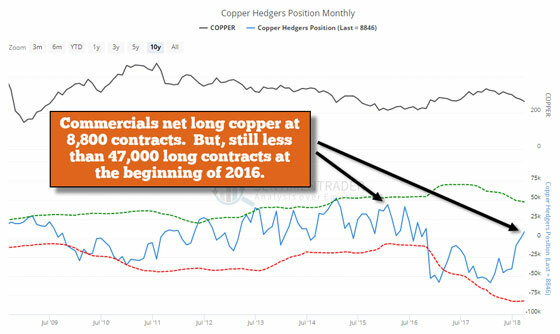 When copper fell to a low at the beginning of 2016, the Commercials held 47,000 net long positions. Today, the Commercials are only net long by 8,800 contracts. Thus, the Commercials can continue to add another 40,000 long contracts as the copper price falls to equal the same level in 2016. I must say, it’s quite interesting to see that silver and platinum severely underperformed, palladium, oil and to a lesser extent, copper. You would think that industrial metals would trade in unison, but this wasn’t the case over the past two and a half years. So, in looking at the data, the market is setting up for a reply to the 2016 correction, but only worse. 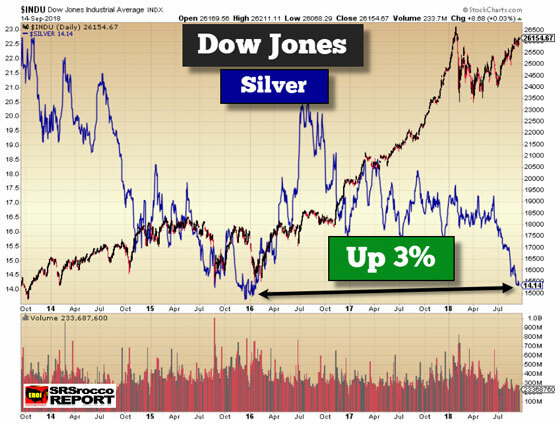 Both silver and platinum are now back at their lows, with gold not too far behind while the Dow Jones Index attempts to make another Blow-off top. When the markets finally roll over, I believe gold, silver, and platinum will likely be the best performing precious metals investments during this time. 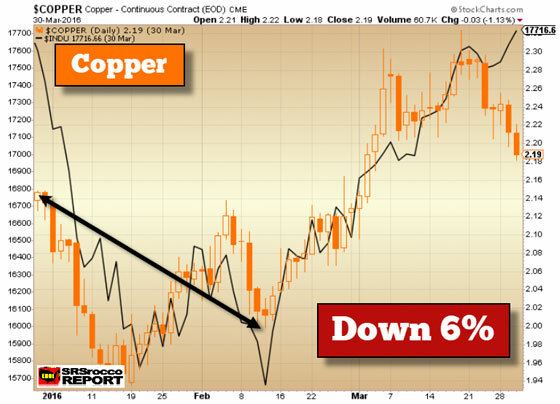 Unfortunately, copper and oil will likely suffer declines during the market downturn as these are more subject to deflationary pressures being the king industrial commodities. 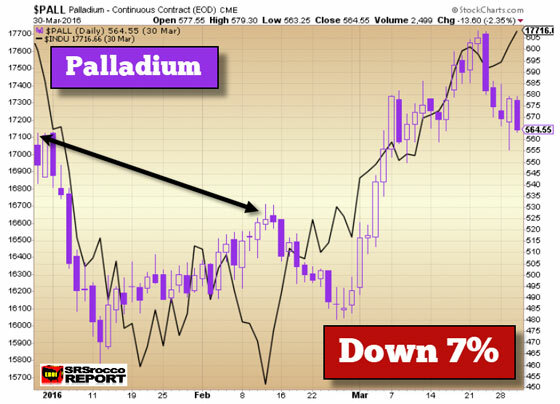 However, palladium is most certainly the wild card here. 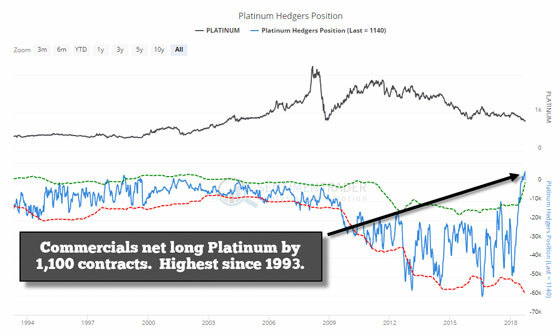 On the one hand, palladium seems to be overbought, but on the other hand, it’s Commercial hedgers’ short positions are closer to their lows. Also, the majority of the platinum and palladium supply is used as autocatalysts in the automobile industry. More importantly, a great deal more palladium is used than platinum by the auto industry. For example, according to the 2018 GFMS Platinum Group Survey, forecasted autocatalyst demand this year will be over 8 million oz of palladium compared to only 3.3 million oz of platinum. 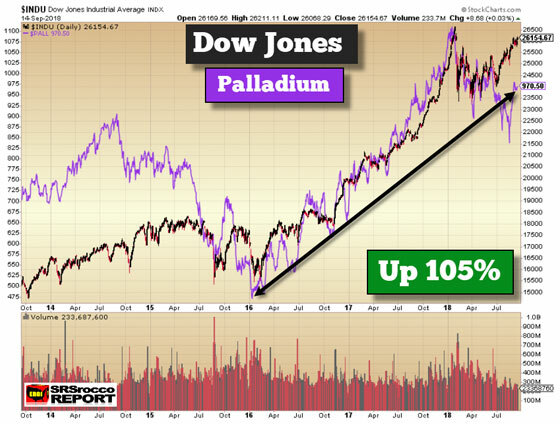 Therefore, palladium is more at risk than platinum during a downturn in the automobile industry. Moreover, GFMS forecasts nearly six times more platinum investment (292,000 oz) than palladium (59,000 oz) this year. And if we consider that 93% of palladium is consumed by industrial uses (minus jewelry and investment) versus 70% for platinum, palladium is more at risk during a severe economic downturn. In conclusion, the evidence shows that precious metals that are likely the safest bets during the next market crash are gold and silver. 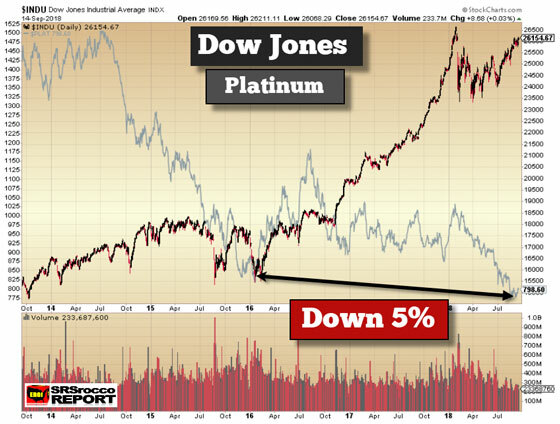 However, platinum may be the preferred industrial precious metals over palladium as investors protect their wealth during the next market crash.